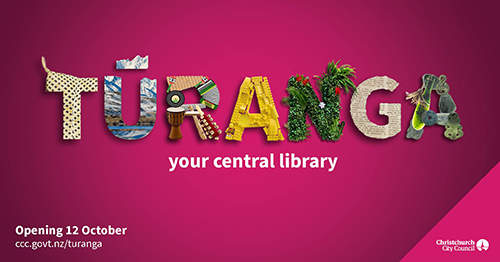 Tūranga - your new central library - opens this weekend! We've got music from The Breeze and More FM, food trucks, and a walk-through of five floors filled with activities, new technology, and, of course, books! There's plenty more exciting things happening in the city so we've made a list of other places for you to check out to ensure that you have an awesome weekend. Check out Wall to Wall a special exhibition where you're invited to paint on the walls. That's right! You can paint on the walls! All materials are provided so head on down and add your mark. The Yellow Moon exhibition, where all the art is yellow, is also a lot of fun and crocheters are invited to add a 'crater' to the yarn moon. Those driving in the city will be interested to know that the Art Gallery carpark has the first hour free. Just a short walk from the library you'll find this amazing playground on the banks of the Avon River. The BBQ and picnic area is perfect for a special lunch out. The playground features a huge jungle gym, several slides, and a flying fox big enough for grown-ups. Down by the river you might even spot an eel! Keep an eye out for the swallows and fantails darting around the riverbank. Right across from the library you'll find Little Andromeda, a pop-up venue hosting 75+ shows during October and November. The line-up includes live music, theatre, comedy, and dance. Something for everyone! Visit any time - there's lot of free and reasonably priced shows almost every afternoon and evening. There's food trucks in the courtyard which makes it a beautiful spot to just hang out. Little Andromeda will be holding events as part of FoUNd: Festival of the (Un)dead and FESTA. Rollickin' Gelato is handily located in both New Regent Street and the Arts Centre! Delicious and ever-changing flavours, plus some truly indulgent desserts. Dairy-free options available. If you're using the Lichfield Street Carpark (first hour free), take the Plymouth Lane exit and you'll pop out onto Cashel Street and find the BNZ Centre. These laneways offer a host of lunch options. Our top pick is Wok It To Me and their bubble waffles. You'll also find Scorpio Books here for when you just can't wait for that library hold! If you're planning on parking at the Crossing ($2 for 2 hours) have a look around before you head to the library. The Crossing is home to several eateries such as Cookai - whose sushi train is pretty exciting - and Piki Poke. The Crossing is also a fashion hub where you'll find brands like Witchery and Country Road. Makeup lovers will enjoy the NYX store and are only a short walk from Mecca Maxima and Ballentyne's. Christchurch's new entertainment centre features a floor of eateries with unique dining areas and a state-of-the-art Hoyt's cinemas upstairs. Hoyts Entx has comfy recliner chairs in all cinemas as well as Xtremescreen and LUX options for the serious movie-goer. If you enjoy this dining style, visit Little High Eatery. It's across the road from Alice Cinemas giving you another dinner-and-a-movie option! Classics and History fans will love the Teece Museum at the Arts Centre. The current exhibition, 'Beyond the Grave', explores the subject of death in ancient Greek and Roman culture through the items they left behind. It may be a little museum but the artefacts are always wonderfully presented and there's activities to keep younger visitors busy. The large mosaic of a dog is sure to delight! For those keen to know more about Ancient Rome and Greece, head along to the free talks being held as part of Beca Heritage Week and FESTA.